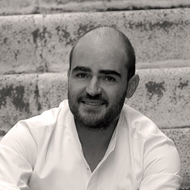 Javier Guillén put his mind to working with the best ones; not in order to repeat their recipes, but to find out how creativity came out of them and how they introduced each new creation to their customers. 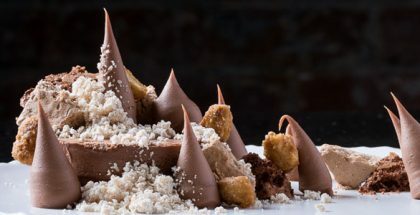 This is how he went through different teams, like those of Pierre Hermé, Oriol Balaguer, Willy Dufresne, El Bulli, Valrhona… We are referring to the Spanish chef Javier Guillén, a globetrotter of pastry who has just settled down (permanently?) in Brazil. ‘I had always felt attracted by the friendly people here, the countless raw materials one can find here, fruits, vegetables… and the great possibilities of development for pastry in this country’, states the chef. He advices professionals and also the incipient high-end 100% Brazilian chocolate manufacturers which start to proliferate, visits cocoa fazendas and teaches courses in universities and schools throughout the country. Guillén is witnessing the awakening of a sector in a country with endless possibilities, ‘we’re experiencing an increase in the consumption of fine cocoas and more modern chocolate and pastry stores are opening. Something is changing here.’ However, there is something which he terribly misses (as well as his family) – gin and tonic. Javier Guillén shares some of his creations from his 2013 collection with so good.. It is a total of 50 recipes, out of which there are 30 simple ones, with defined, accentuated flavors, but with a delicate, looked-after decoration… The remaining ones make up the ‘Rouge Collection’, inspired by that warm color widely found in nature, such as in one its most attractive fruits – the raspberry. Discover in so good #10. Sift all the powdered ingredients together. Add the butter and chopped hazelnut. Place in a mixer with a paddle and mix until obtaining small balls. Stop mixing and pour over a Silpat. Store in the refrigerator. Place the streusel into each ring (12 cm Ø) and press down slightly. Bake at 150ºC in a convection oven 15 to 18 minutes. Heat the first measurement of cream and add the gelatin. Slowly pour this mixture over the praliné. It will rapidly come apart. Gradually add the remainder of the cream until obtaining a very elastic, glossy texture. Heat the blackberry purée and add the mixture of pectin and sugar, then the bloomed gelatin. Simmer for one or two minutes. Add the blackberries and leave to cool for a few minutes. 210 g in each ring, 14 cm Ø. The previous day, make a cold infusion with the vanilla and milk. Strain and heat the milk. Little by little, pour the hot liquid over the chopped chocolate and mix with a spatula (as if making a ganache) to a smooth, elastic and glossy texture. Puree the mixture with a hand blender to complete the emulsion being careful not to add any air. When at 30ºC, gently fold in the semi-whipped cream. TIP: keep some of the mousse aside to make the decoration of the cake once sprayed. Melt the cocoa butter and couverture. Add the titanium oxide. Process with a hand blender. Pass through a sieve for extra precaution. Use at a temperature of 40 to 45ºC. Make the blackberry compote, chill and pour over the praliné crémeux. Freeze. 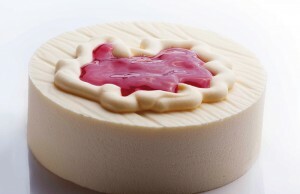 Once the filling has been unmolded (streusel, praliné crémeux and blackberry compote), make the vanilla mouse. Pour the 210 g mousse into each ring and insert the filling. Blast chill. Unmold the cakes and spray. 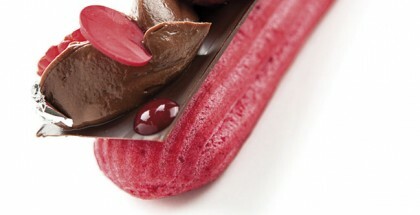 Garnish with a crown of mousse on the top and fill with a red fruit jelly.